Taking advantage of the efficiency of having the undivided attention of an AUSA audience, which was four times larger than that of last year’s winter conference, Team Redstone hosted an exceptional small-business seminar the day before the conference. 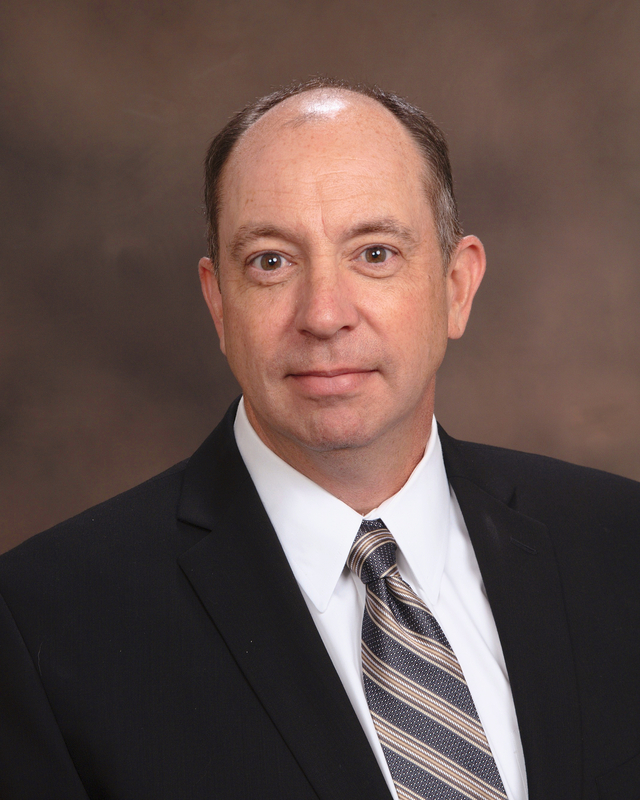 The seminar was hosted by a team comprised of NASA, Army Materiel Command, Missile Defense Agency, and the Strategic Missile Defense Command, along with the Army’s Office of Small Business. This was a great networking opportunity, and it revealed some great information about opportunities for ProModel in DOD and NASA. 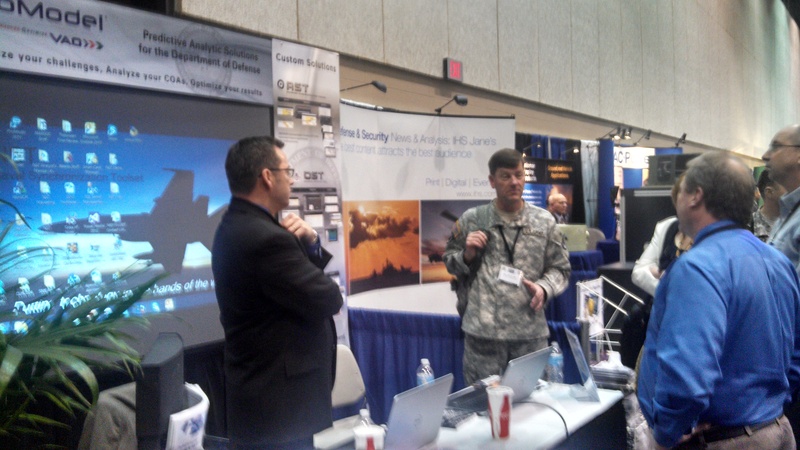 On Wednesday, February 18th, the ProModel team entered the exhibit hall with great excitement and a superb opportunity to demonstrate how our custom DOD solutions and Commercial Off the Shelf (COTS) products are evolving. Many of the attendees expressed that they were on a continual quest for accurate budgeting projections. The Enterprise Portfolio Simulator (EPS) cost module, which is being piloted as a module of the ARFORGEN Synchronization Toolset (AST) at Forces Command, demonstrated a clear visualization of such projections. This EPS capability assists the Army (and it can assist any organization) in applying cost data at the tactical level. The EPS module then rolls that data up in a package that reflects enterprise budget estimates, which in turn reflect a variety of demand or demand-fulfillment scenarios. 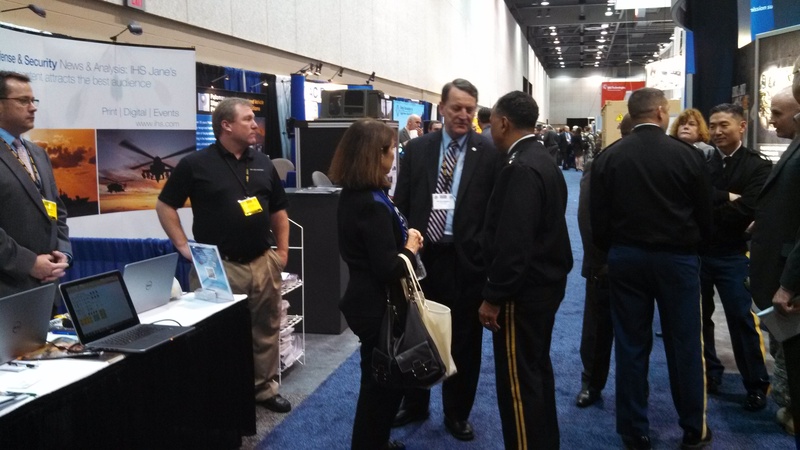 Four Star General Dennis Via, Commander of the US Army Materiel Command (center right) and Major General (Ret) Freeman from Deloitte (center) visit the ProModel booth and discuss the positive impact that DST-SM is having on the Army Materiel Command. Another highlight was the demonstration of, and interest in, our COTS products like Process Simulator and EPS. DOD elements and industry are seeking ways to gain greater efficiency and to stretch their limited resources. While force structure is being reduced, missions and the need for continual modernization are not. The expectation of those funding DOD is that the military will be increasingly efficient in the execution of prescribed tasks. Therefore, an understanding of how to generate efficiency through Lean practices and events, and of how to predict equipment life-cycle costs in a peacetime environment, is paramount. Additionally, leaders in DOD expressed how they must apply Lean principles to their processes, identify trade-offs, and understand the downstream impacts of change. Process and portfolio management are significant across the government sector, and they will become even more necessary during this time of decreasing budgets. EPS and Process Simulator, coupled with ProModel’s customized solutions (AST, LMI DST, and NST), provide the foundation for rapid process improvement, budget estimation, and program management. Thanks to the exceptional hospitality of the Tennessee Valley and the great response by our AUSA hosts, ProModel found in Huntsville some fertile ground that will grow much more than cotton. This entry was posted in GOV/DoD and tagged army materiel command, AUSA, capacity planners, Consulting, enterprise performance, Pat Sullivan, predictive simulation, promodel, simulation products, simulation toolset, technology, transportation, u s navy, US Army. Bookmark the permalink.